Juventus sealed a win against Cagliari this evening with a wonderful counter attacking which involved all three of their deadly attacking trio. Juan Cuadrado started the move deep into Juventus’ own half before playing the ball into the ‘Old Lady’s’ captain Paulo Dybala who launched a counter-attack with a perfectly weighted pass into Cristiano Ronaldo. Ronaldo carried the ball forward and waited for the perfect time to pass to Cuadrado who hammered the ball into the back of the net with a tidy finish. Dybala – Ronaldo – Cuadrado ??? 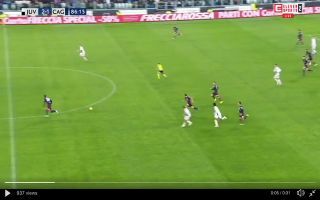 A Juve counter attack goal to wrap things up. Ronaldo with the assist and Cuadrado with the finish ? Juventus’ deadly attacking trio of Ronaldo, Dybala and Cuadrado could see the Italian giants end their long wait to lift the Champions League trophy which has somehow evaded them in recent years.